We have developed a highly effective range of ball screw jacks that has been appreciated to ease the hardship of heavy duty machine movement and various other lifting applications. These are available in upright, inverted and cubic models and can also be customized as per the specifications provided by our clients. 1 to 30 Ton capacity, up to 2000mm Stroke ball screw jack for steel re-rolling mill industry. Mechanical Ball Bearing Type Screw Jack Without Tommy Bar. - Up right Trapezoidal or Ball screw jack. With our expertise in this domain, we offer our clients Ball Screws and Support Bearings. To ensure maximum efficiency, these bearings are provided with precision machined housing and ball screw support. Support bearings that we offer for ball screws are corrosion resistant and have high tensile strength. Banking on our enriched industry experience, we are able to supply Ball Screw Jacks. We are ranked amongst the most trusted firms deeply engaged in offering a wide range of Screw Jack Apparatus. 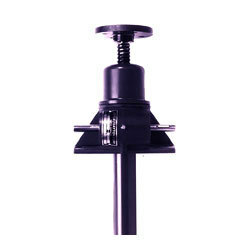 Consists of a self contained wall bracket with a steel screw of 3cm diameter. The screw has 5 T.P.I. 'V' type pitch. Complete with large force pulley two jockey pulleys, hooks and cords. Weights are not included.